So that students can keep their data even when they're not using Education Perfect for an extended period of time, we set their accounts to inactive when they're not in any classes. 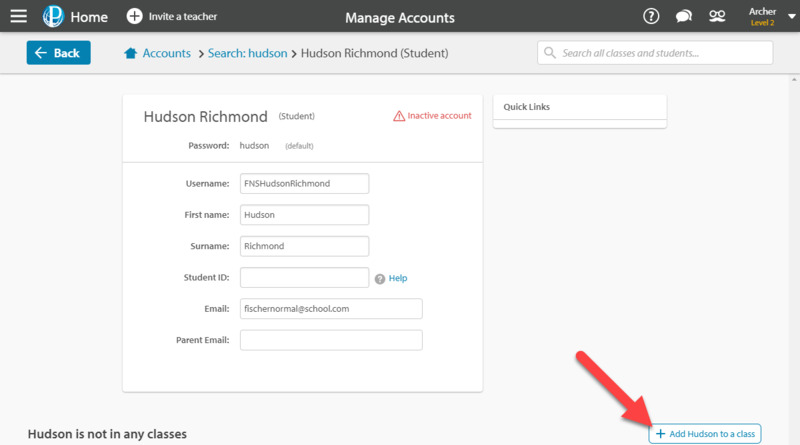 If you search the name of a student and find that their account is inactive, you'll have the option of adding them to a class. Simply click on the blue 'Add X to a class' at the bottom right corner of their account page and select the classes you'd like them to be added to. When you're adding students directly to a class, you might search their name and find that their account isn't in any classes. Click the Add to class button next to their name to reactive their account. If you find that a student is still listed as inactive after assigning them to a class, try refreshing the page. In the rare event that this does not resolve the problem, please contact our support team. Teacher accounts are slightly different. Inactive teacher accounts aren't visible to any users at your school, nor are you able to log into one. If you would like a teacher account reactivated, send us a request at support@educationperfect.com.